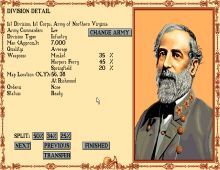 Probably one of the worst Civil War games ever made, M. Evan Brooks sums it up well in his synopsis of this ambitious wargame from Impressions: "[The Blue and The Gray depicts] the American Civil War, with all the wrong lessons. The strategic conceptualization was simply wrong, and the tactical battles seemed to have little reference to history. As a game, it could be fun; as history, it was a disaster. Individual battles could be "zoomed", although the accuracy of such play brought the very concept into question. Admirable for what it tried to do, the problem was that it failed to reflect its subject matter."